Includes 8 Stroke CME Credits! 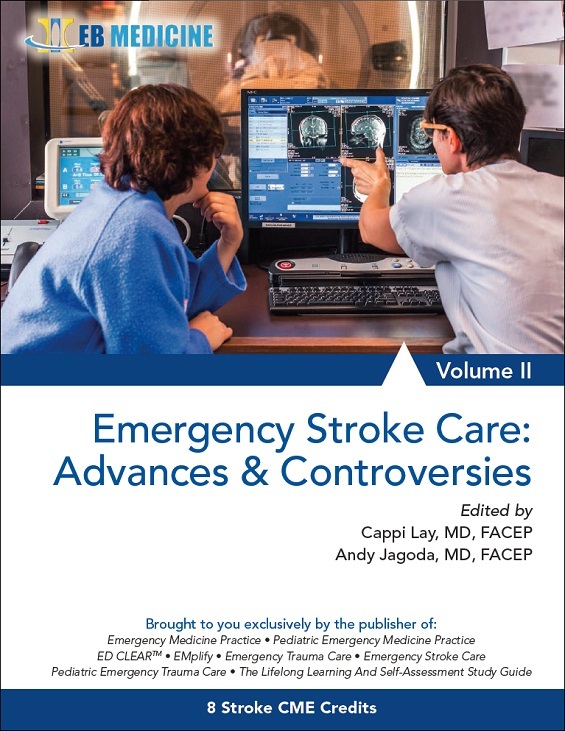 This resource is designed to meet the needs of emergency clinicians in stroke teams, with an evidence-based analysis of the current literature in acute stroke care on the following topics: Aneurysmal Subarachnoid Hemorrhage, Cerebral Venous Thrombosis, Ischemic Stroke of the Posterior Circulation, and Intracranial Hemorrhage. It also reviews current and emerging practices in Stroke Systems of Care and Shared Decision-Making. To view a sample of Emergency Stroke Care, click here. Is Shared Decision-Making The Same As Informed Consent? Patient Preferences: What Do Patients Want? When Is Shared Decision-Making Appropriate In The Emergency Department? I am now better informed of how to address hemorrhagic strokes. Very informative! I will be more aggressive with CTA studies and have a better PE for vertigo patients. I will incorporate the ideas from shared decision making into my practice. This improved my knowledge of appropriate imaging selection. Great course! I will have greater awareness regarding posterior cerebral circulation strokes and their treatment options.